Enter the Proxy Server URL in the window that appears, then select "OK". To run DAV Explorer without a proxy server, simply delete the entry in this dialog. To use DAV Explorer with an SSL-enabled WebDAV server, start it with "DAVExplorerSSL.sh" or "DAVExplorerSSL.bat", depending on your computing platform. If you select "No" here, the connection is aborted. 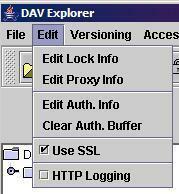 Once the SSL connection is established, all communication between DAV Explorer and the selected WebDAV server is securely encrypted. 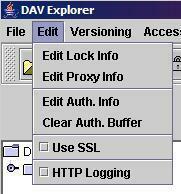 The following screenshot shows the main DAV Explorer window after an SSL connection has been established.